The New Zealand eventing season culminates at Taupo this weekend when the national titles are decided at the NRM National Three-day Event. Competitors, officials and volunteers have arrived, the course is looking magnificent and the weather forecast is very bright. In conjunction with this competition, an FEI Level 2 Course for Eventing technical delegates, course designers and judges is being held. It is being led by Mike Tucker from England, with Frenchman Pierre Michelet the course design specialist and Mary Seefried from Australia the dressage specialist. The Australian presence is carried through in the officials involved in the event, with Lyn Roycroft the President of the Ground Jury and Brendan Croese Technical Delegate for the CCI2* and CCI3* classes. President of the Ground Jury for the CCI1* are Stuart Bishell (Timaru) and Winky Foley (Kumeu) for the CCN105. There are 12 contestants for the CCI3* after the recent withdrawals of Joe Waldron’s Springvale All Black and Campbell Draper’s Kahurangi Manu with minor but event-stopping injury. “Taupo expert” Donna Smith will be back to defend her title with Balmoral Tangolooma. The pair were clear winners last year but will have a challenge on their hands looking at the quality of this year’s field. Eventer of the Year and recent Kihikihi Horse Trials winner Clarke Johnstone with Balmoral Sensation will be one pair to look out for. Johnstone is keen to put the Wills trophy for the CCI3* NRM Open National Championships in his trophy cabinet to make up for a disappointing result at the Sydney Three-Day where the pair fell early in the cross country course. The only other combination from last year’s class back to have another crack at the title is Angela Lloyd with Song. The pair finished eighth last year and are deserving of a bit of luck at Taupo after a mixed season. The striking grey Britannica MVNZ was fifth last year with Donna Smith but is ridden this year by Bundy Philpott from Cambridge. The pair have been consistent performers this season. Matthew Grayling and Henton Executive claimed the Honda CCI3* at Puhinui last December so will be keen to repeat their success at this level in Taupo. Grayling also has NRM Lowenberg in the class. Other riders predicted to feature include Samantha Felton who has had an impressive season with Ricker Ridge Pico Boo. Simon Gordon and Fletch.com are also familiar with the winner’s podium, while Kelsey Rothery has been placed in two other major events at this level this season so will be looking for a win, too. Both Shelley Ross (Auckland) and Abby Lawrence (Bay of Plenty) have also had consistent seasons and could well be poised to take home the winner’s cheque of $3000. Throughout the New Zealand eventing season, the competition at 2* level has been intense and it is shaping up to be no different at Taupo. Some 33 combinations are entered to compete for the Bates CCI2* Championships, competing for the Picadilly Trophy and the $3400 total prizemoney. Bundy Philpott has three entered and Sophie Wilkinson, Samantha Felton and Dannie Lodder each have two horses in the field. The Mamaku Trophy is for the winner of the Fiber Fresh CCI1* Championships. There are 48 entered in this event, and it really could be anyone’s trophy. Other classes being contested include the Thomson Trophy for the Bombers Equestrian NZ / Prestige Legacy Horse Floats CCN105, the AMS Saddlery CCI1* Open and the Wade Equine Coaches CCN105 Open. The National Young Event Horse Championship will be held on Friday 16 May and has attracted some talented youngsters. 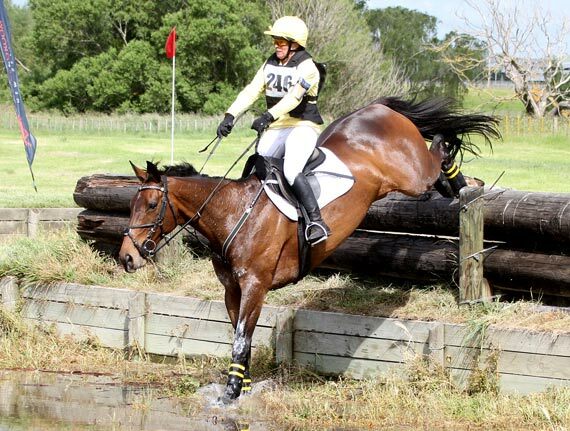 The NRM National 3 Day is also the final event in the ESNZ Eventing Series. With double points on offer, it can have a big influence on the final result. The series include the Super League, AMS-Erreplus Pro- Am, Amateur, Massey University Young Rider, Alltech Junior Rider and Weatherbeeta Grassroots Series. This is the fourth year John Nicholson has been the course builder at this event, and we have seen some changes to last year’s CCI3* and CCI2* courses. Chris Lever (Wairarapa) is the new designer for the CCI1* and CCN105 cross-country courses, and is a master at chainsaw sculpting, producing some amazing results. The Silver Spurs Trophy for the South Island v North Island teams always creates a lot of interest. There is a strong South Island contingent making the trip north including Brent Jury, Emily Cammock, Ellie Braddock, Larissa Srhoy and Davina Waddy, who is fresh from winning the National Three Day Event Junior Rider Championships. The teams will be named later today. A new prize is going to create even more interest for those competing on thoroughbreds. The Thoroughbreds in Equestrian Sport (TiES) prizes will be awarded to the six highest placed qualified thoroughbreds in the CCI1* classes. There is also a prize for the highest placed Pony Club member. Another prize up for grabs will be decided at the Horse Inspection on the Sunday morning. It won’t be just the horses under scrutiny, the fashion police and judges will be looking carefully at the riders to decide who will win the Equissage prizes for the best dressed. Dressage is on Friday, May 16, cross country on Saturday, and showjumping on Sunday, May 18. There will be live streaming available of cross country and showjumping on Event Freak.